In southeastern Utah, near the town of Moab, is a wonderland of more than 2,000 sandstone arches, set in a picturesque landscape of soaring fins and spires. This is Arches National Park. 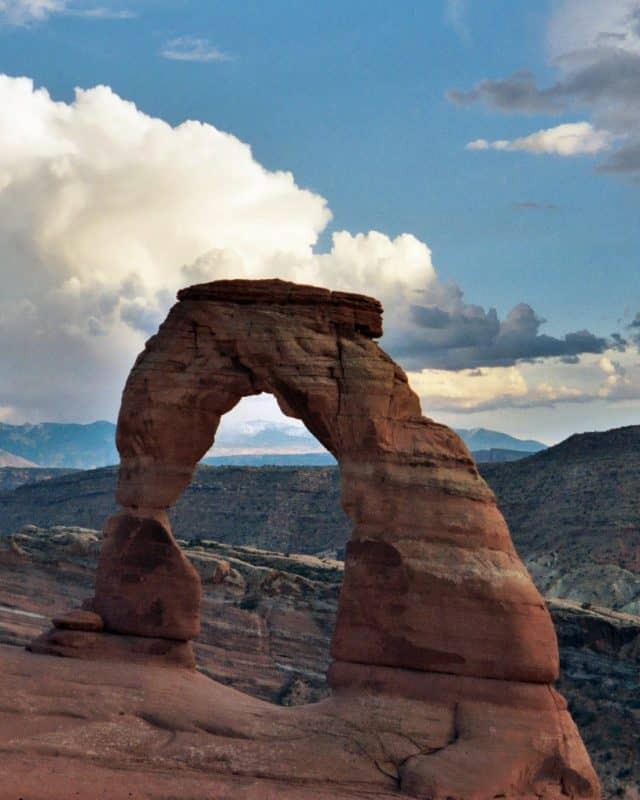 If you have visited Utah previously, you have probably seen an illustration of Delicate Arch, the park’s best-known formation, on the license tags of Utah vehicles. The park is about four hours driving time from Salt Lake City, but it is in close proximity to other parks and recreation areas like Canyonlands NP and Glen Canyon NRA that you may wish to consider visiting during the same trip. The Park is open year-round, twenty-four hours per day. The visitor center has variable hours depending on the season and is closed on Christmas Day. Arches National Park is in the high desert, an area with an elevation more than 4,000 feet above sea level, resulting in wide temperature fluctuations. The most popular seasons are spring (April-May) and fall (September-October) when the temperatures are moderate. Summer highs can exceed 100 degrees Fahrenheit, making physical activities very strenuous, but after the sun goes down, summer lows average in the 60s. Winter highs average in the 40s and winter lows average in the 20s. Paved roads through the park provide views of many of the interesting features. There are several short side trails, less than half a mile each, that offer views of the formations from a closer perspective. You can drive all the park roads and stop at the viewpoints in about half a day. 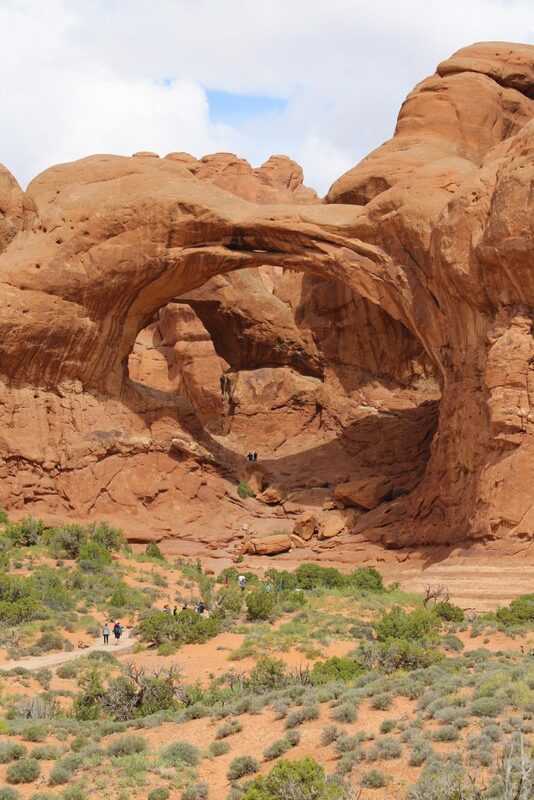 For the more adventurous, there are many hiking trails in Arches, varying in length and difficulty. Some of the park’s distinctive features can only be reached by hiking. One great choice is the Devil’s Garden Loop hike, a seven-mile hike that takes visitors to eight magnificent formations. The trail out to Landscape Arch is relatively flat and easy. With an almost 300 foot width, Landscape Arch is the widest arch in the park. You can turn around at this point and return to the trailhead, a round-trip of about two miles. If you continue beyond Landscape Arch, the terrain requires a little scrambling and passes over some narrow ridges. Here the trail is steeper and more uneven, although more appealing. Here you will really see the structure of fins, the parallel walls of rock that make up the Devil’s Garden. Possibly the most popular things to do in Arches is the park is a ranger-guided hike through an area called the Fiery Furnace, a jumbled maze of fins and boulders named for the flaming color of the sandstone at sunset. It’s a place you could get lost in easily without a guide. The hike is offered twice daily and fills up quickly, so reservations are a must. You can reserve online or in person at the visitor center up to seven days in advance. The hike involves some scrambling using hands and feet, requires shoes or boots with good traction, and is not recommended for children under five years of age. Arches is a relatively small park, and most of the formations are near roads and trails, so there is little backcountry. If you’re looking for backcountry adventures, a park like Canyonlands offers many possibilities. There is one campground at Arches. It has 54 sites with picnic tables and grills, potable water, and toilet facilities. There is no food, gas, groceries, or lodging, other than camping, available in the park. All these services and many others are available in Moab, just five miles from the park entrance. There are a few important things to remember. Because this is a desert environment, humidity tends to be low. Sweat dries quickly, so you may not realize you’re sweating as much as you are. Carry and drink plenty of water. Drinking water is available only at the visitor center and the campground. Always wear appropriate footwear. Flip-flops or high-heeled shoes will make walking on the uneven ground difficult. The terrain is rocky and can be slick. Good shoes with deep tread can help you avoid twisted ankles and falls. Please stay on trails and paved roads. In undeveloped areas, the park is covered with a biological soil crust, a living ground cover that provides a base for plant growth. Cyanobacteria, or blue-green algae, form linking fibers that hold fragile soils together and make them resistant to erosion. The crust absorbs water which plants need to survive. Walking or driving on this crust crushes or compresses it, separating the linking fibers and making it susceptible to erosion by wind and water. While you’re there, look out for Utah juniper. This fascinating tree has gnarled branches and forms amazing shapes, but its real trick is that it can actually shut off water to some of its branches in a drought in order to preserve the life of the rest of the tree. If you’re really lucky, you’ll catch a glimpse of a desert bighorn sheep. Once on the brink of extinction, they are making a slow comeback due to the park service’s reintroduction program. They are very shy of human contact and blend well with their environment, so it will take a sharp eye to spot one. The best place to keep watch is in the first three miles of the park road. A pair of binoculars can help. The awe-inspiring beauty of this place will live on in your memory (and your photographs) long after you return home.